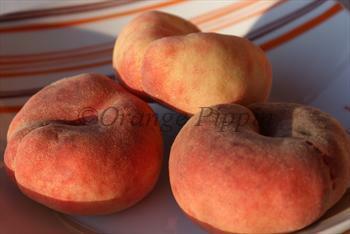 This is an unusual flat peach which looks a bit like a doughnut, and is occasionally available in supermarkets. Saturn is a white-fleshed peach and has the characteristic delicate flavour of white-fleshed varieties. Whilst the flat donut shape of this peach may appear to be a marketing curiosity, don't let this put you off, because the flavour is excellent. An unexpected benefit of the flat shape is that Saturn is easier to eat than normal peaches, more like eating a cookie! Please fill in the details below and we will let you know when Saturn peach trees are back in stock. Saturn is self-fertile and does not need a pollination partner, although fruiting may be improved if there is a compatible tree of a different variety nearby. Saturn is not resistant to peach-leaf curl, so be sure to protect the tree from infection in late winter / early spring - covering the tree with a fleece is a good method. Saturn is a vigorous and productive variety and is likely to need thinning to get the best results. Saturn needs to be planted in full sun in a sheltered situation for the best results, but the tree is cold-hardy throughout the UK and with care can be grown successfully quite far north. Although it looks like a modern invention, Saturn is actually quite an old peach variety. It is thought to originate from China, and was known in early Victorian times under various names including Flat China, China Peach and Java Peach. 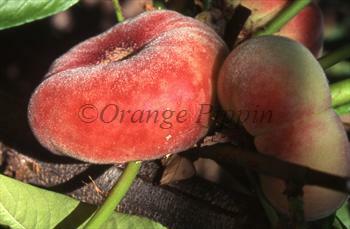 It is also known as a Flat Peach or Donut Peach.